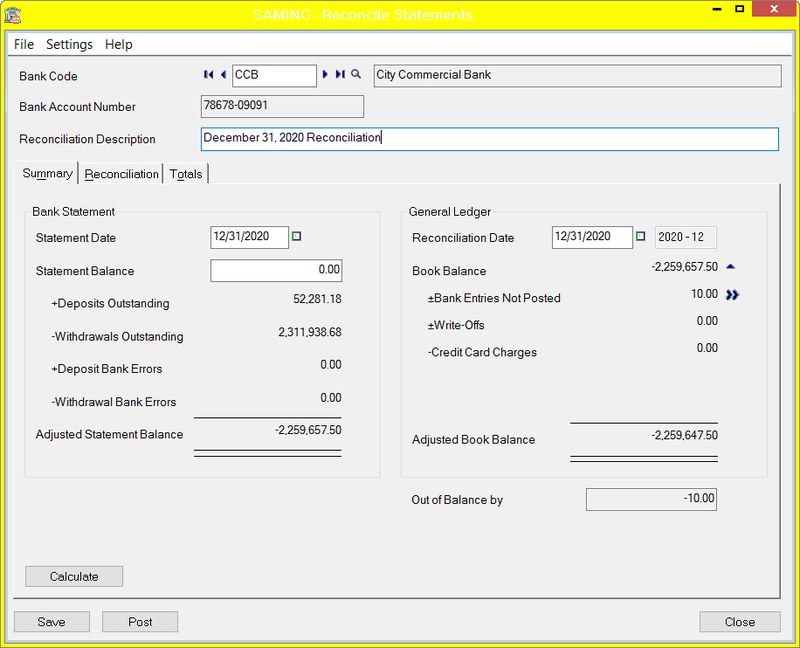 Bank subledger balance (Book Balance) is compared to the GL balance is compared to statement balance in the reconcile screen To refresh these numbers, possibly picking up newly entered transactions, select the calculate button. 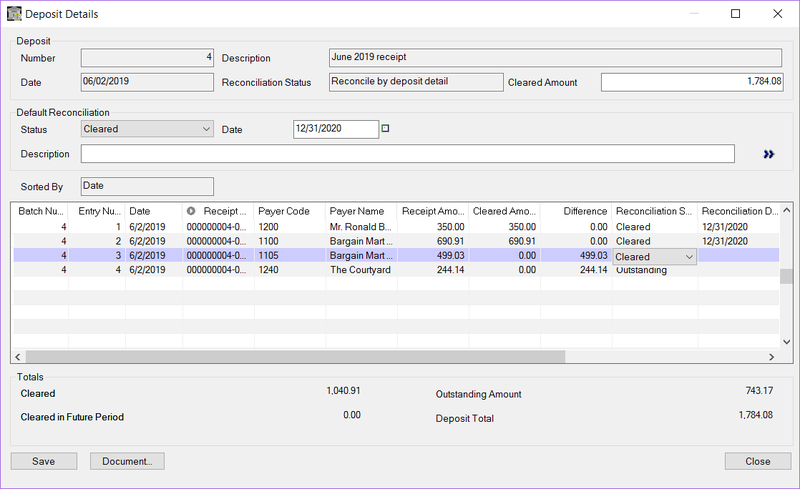 Total deposits and total withdrawals in the reconcile detail screen (See the picture below, right above where it says "bank entry"). You can reconcile deposits in detail. For example if there are four credit card payments for a given posting date, of which post on one statement, and the last of which posts on another statement, you can clear just the four for the statement you are working on, and clear the last one on the next statement. 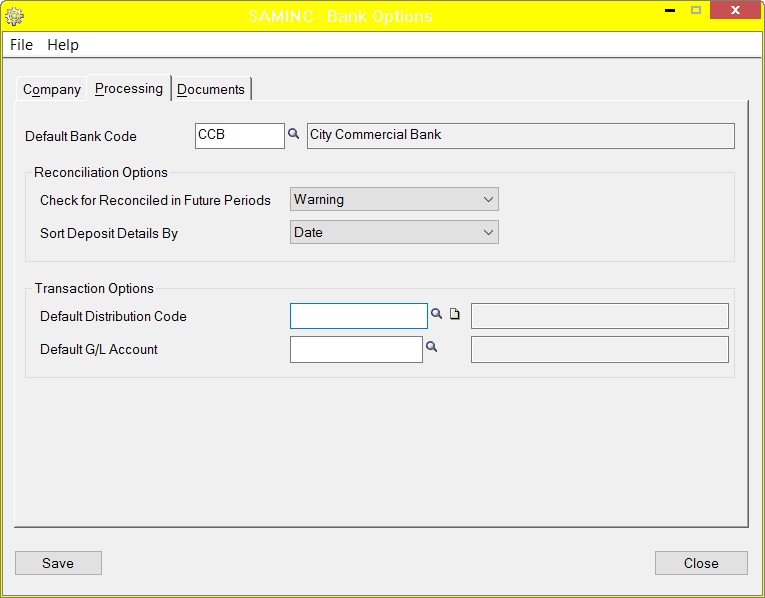 In Setup, select the bank you are working on as the default bank code. In the example below, CCB has been selected. This way, you don't accidentally enter bank entries in the wrong bank. 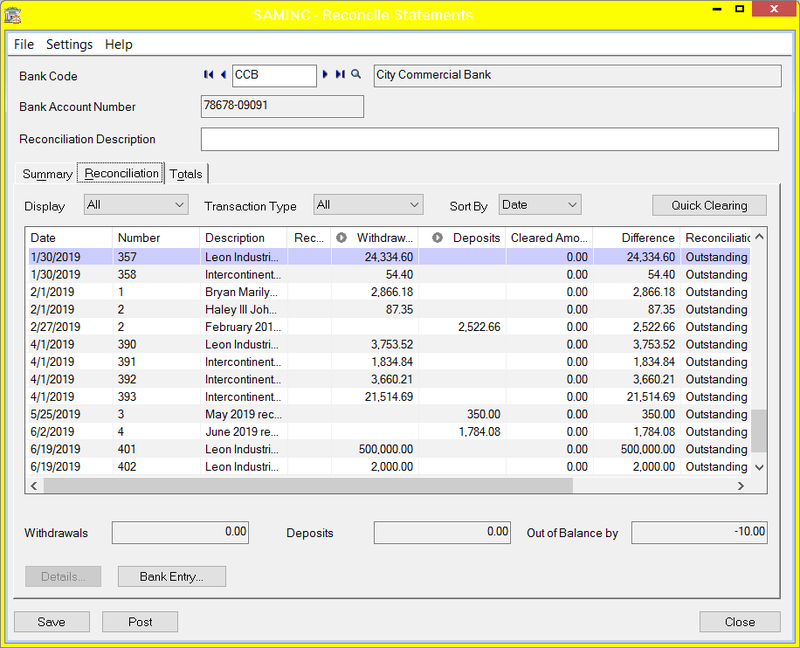 Reconcile deposits and compare to statement deposits total. The deposits in the statement should already have been entered in AR. Reconcile checks and compare to statement checks total. The checks should have already been entered in UP, CP, AP, or AR. Use the BK distribution codes to quickly select the correct GL account during data entry. For example, if you have a lot of marketing related charges on the credit card, make up a code like MKTG which automatically points to the GL account for marketing expense. 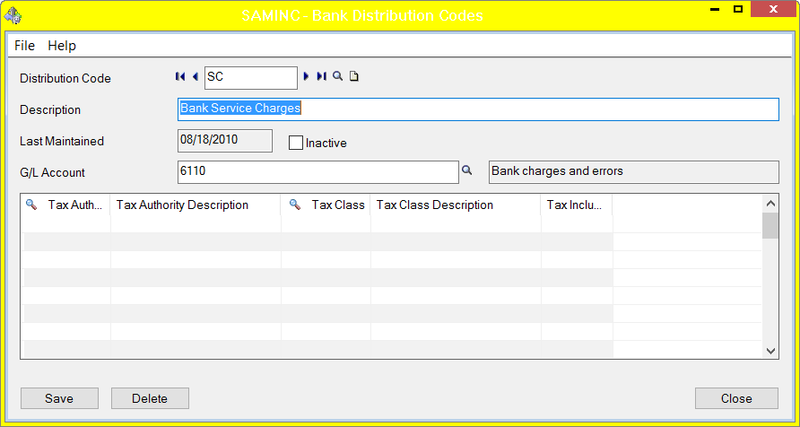 The example below uses "SC" to select the bank charges account. Be very careful to enter the date correctly. 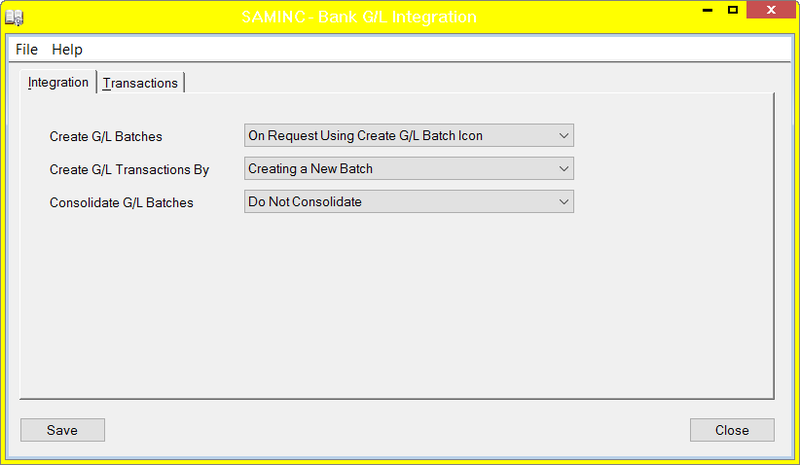 Turn off the auto-create GL Batch feature in GL integration and wait until the totals reconcile to 0 before posting the bank entries. That way, you can correct date and amount errors without reversing, and a slightly annoying posting detail message doesn't appear for every bank entry you make. Reconcile all other withdrawals (e.g. service charges. Once the bank reconciles to the statement, then post the GL batch and make sure the bank reconciles to the GL. If it doesn’t, check the GL transaction files to see if there was a journal entry made directly to the GL account. If you thought there are entries that were accidentally made in a future date from the statement, it is fast and easy to change the date on the reconciliation to the end of the year and then go into the "reconcile" screen to see if those records appear with the wrong date. Once you get the hang of this process, you will probably find like I have that you like Sage 300 reconciliations a whole lot better than Sage Pro or Quickbooks reconciliations.